Rayo Vallecano are a fairly unremarkable club. Competing with Getafe to be Madrid’s third biggest side, their most newsworthy recent story has concerned their financial problems. More positively, they have a reputation for attracting some of the noisiest fans in La Liga, with their ultras gathered behind the only end of the ground that boasts a stand – the opposite end is simply a wall covered up by advertising hoardings, with a couple of high-rise apartment blocks behind. But there’s something that Rayo are better at than any club in Europe’s major five leagues (Spain, England, Italy, Germany and France). They complete more interceptions than any other side, 39.2, per game. (All stats here from WhoScored). Instead, Spanish football places a large emphasis upon intercepting. From WhoScored’s statistics from the major five European leagues, 18 of the top 20 interceptors in Europe come from La Liga. The only two missing are Barcelona and Real Madrid, presumably as they have so much possession they don’t need to win the ball back so often. For such a key part of the game to be perfected by the side currently sitting 13th in La Liga is odd, and it becomes more bizarre when you look at other key Rayo statistics. They see a lot of the ball – 51.3%, the 8th highest in La Liga. You can only intercept the ball, of course, when the opposition have possession, so one wouldn’t expect Rayo to be so good at this aspect of the game when they generally dominate the ball. They also have an excellent record in terms of conceding shots. Only Barca, Real and Malaga concede fewer shots than them, the same is true of shots on target. Yet despite this, and the prolific rate of interceptions, Rayo concede a lot of goals, the 5th most in the league. So why do they complete so many interceptions? First, the mentality of the team is geared towards winning the ball quickly. The side pushes high up the pitch, with the forwards starting the pressure and generally forcing the opposition goalkeeper and defence to hit the ball longer. In Spain, forward balls played in the air are relatively rare compared to in England, France or Italy – therefore even the longer balls are played along the floor, which are inevitably more likely to be intercepted along their course. Rayo’s midfield combination is interesting. In a broad 4-2-3-1 system, the two holding players are particularly defensive minded. Javi Fuego plays a very deep role, as a ‘centre-half’, looking to drop into defence as an extra centre-back if necessary. Meanwhile, Jose Movila plays around ten yards higher up the pitch, but in a strict ball-winning role. He charges acrosss the pitch like a terrier to protect the five players behind him, and wins the ball more frequently than any other Rayo player. To have two ball winners in a 4-2-3-1 is hardly a revelation, but given the increasing tendency to have a flexible double pivot ahead of the defence, often with two technical players taking it in turns to go forward, it makes Rayo different to many other teams in Spain. 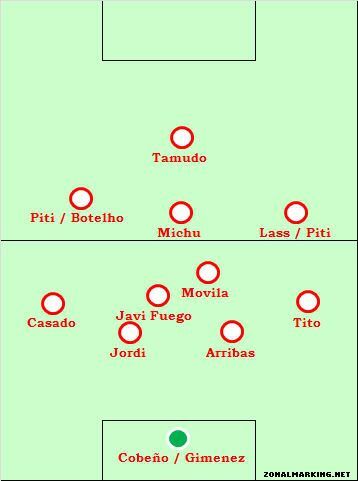 To liken those two to more established players, Fuego plays the Sergio Busquets role, Movila is more like Rino Gattuso. But just because this part of the side is fairly negative, it shouldn’t detract from the fact those two players play higher up, in heatmap terms than they would in many sides, because the whole side plays high up. The centre-backs also contribute to the high rate of interceptions. Jordi is the left-sided centre-back, Alejandro Arribas plays to the right. They track the opposition forward very closely, happy to switch sides to prevent having to pass the marking responsibility on. When the ball is played into the striker’s feet, the centre-backs try to get in ahead of him – Jordi is particularly adept at this. Another clue lies in the use of substitutions. In Sunday’s 2-1 win over Getafe, José Ramón Sandoval brought on two extremely energetic players in the second half to continue pressuring high up. Lass, an energetic wide forward, came on upfront and ran his legs off, constantly moving laterally across the pitch to close down the centre-backs. There was also a debut for young Pepe Maly Diamanka in the centre of midfield – he also chased relentlessly, often late with his tackles and not making interceptions himself, but forcing opponents into hurried, misplaced passes that could be picked up by others. It was notable that these two young players replaced Rayo’s oldest two outfield players – 36-year-old Movila and 34-year-old striker Raul Tamudo, who couldn’t run much in the second half. Rayo are keen to keep energy levels up. It’s also worth considering the impact of the fans upon Rayo’s game – they are amongst the noisiest and most passionate in La Liga, which surely inspires a more energetic game than when playing in front of rows of empty seats. 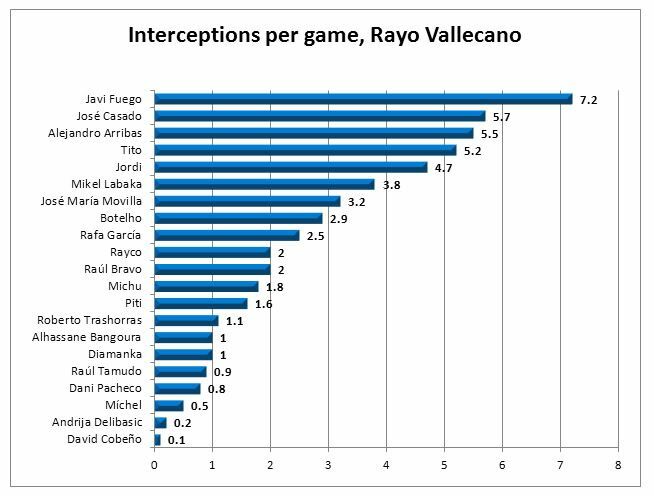 As mentioned previously, Rayo’s high rate of interceptions is not necessarily a positive thing on the whole. In a sense, they seem to share many traits of Andre Villas-Boas’ Chelsea side – they press high up and concede few shots, but those shots are often one-on-ones after the ball is played in behind the defence, which means they concede more goals than those stats would suggest. Their win over Sevilla was their first in five games, and they remain in the bottom half of La Liga. Still, in terms of interceptions, no other club in Europe can match them. NO single Italian club on the list! I’ve heard that the Italian league is the most “tactical” one among the top European competitions. Then shouldn’t Italian clubs’ interceptions be higher? This is probably because Italian sides tend to press less and defend deeper. Hence more focus on keeping shape rather than becoming out of position by harrying. No English sides either, which I think is due to what counts as interception. Italian, and especially English sides, play generally more direct football. This means that many forwards passes leave the ground and teams try to create shooting opportunity as quickly as possible. In addition, teams play more crosses. Eg. Blocking shots and winning aerial battles aren’t counted as interceptions in this statistic to my knowledge, which I consider to be the same thing on a philosophical level; winning/blocking the ball before it reaches it attempted target. I could be totally wrong with this though, since I have no access to Seria A, nor La Liga chalkboards, but it kind of makes sense to me. It’s not as if there’s no teams in Seria A or BPL, which have confidence in their defensive shape. You forgot to mention how much the English froth at the mouth over the prospect of a good old 50/50. In fact (and I don’t think it’s unfair to say so), they probably value a legitimate, strong tackle (or challenge) more than any other nationality/league in the world. Well, to be fair, La Liga is the league where passing is held in the highest regard compared to the other leagues. Do you have any info on the player with the most interceptions/game in Europe though? “Do you have any info on the player with the most interceptions/game in Europe though?” – yup, Javi Fuego, mentioned here. Then Chico of Mallorca and Nacho of Betis. i guess he meant international games/competitions rather than all european leagues combined. on the other hand, you wouldn’t expect the side with the most interceptions to have a relatively low possession rate either, would you? Well, generally sides with high interceptions have little possession. La Liga it’s Rayo, Sociedad, Mallorca – who are 8th, 12th, 15th in possession. Etc. makes much more sense that way. have to admit, that i didn’t check the possession stats for those clubs. You can win the ball, but that doesn’t mean you will retain it for long yourself. (It also doesn’t mean the other way, though, but the statistics indicate the former.) Why would you lose a ball quickly after intercepting it? Consider few examples. 1) When you intercept a ball, the opponent team is out of shape for defending. They need to switch into defence mode, and that takes time. Therefore it opens you opportunity for a quick break. But that requires you to think fast and take your chances with a difficult pass, which often ends up in re-interception. 2) When you don’t see a ball a lot in a game, you have less time to slowly build your attacks, and want to be more direct in your attacks. This is another reason for deciding to play difficult passes just after interception (see 1). 3) When you intercept a ball, you generally don’t know what to do with it. You need to see where your players are and think of what to do. All that gives time to the opposition to intercept the ball back. If they think quicker than you, they might be able to close down all you and your passing option. 4) When you intercept a ball, your team is set up for a defence. They need to switch into an attacking mode. You might not be able to pass a ball to your teammates and lose it. 5) When an opposition loses a ball, they want to win it back, and they are aggresive about it, because they know that they are unorganised at the back. 6) If you intercept a ball in “close combat”, that means you are still close to your opponents and they can win it back the same way you’ve just done it. 7) The very nature of interceptions means you might often not fully control it in the first seconds (half noone’s ball). As you argued in the article, Barcelona and Real Madrid probably don’t need to intercept as often. Thus, a somewhat more telling statistic would be an interception percentage. In other words, the percentage of opponent passes that are intercepted. This would probably be a better measurement of performance, although perhaps not perfect either. if i have misunderstood anything please let me know. Well, that would be a different measurement, and I don’t have the stats to work them out. More informative – I don’t know, a matter of opinion. It would show something different. I think because many of us hold your work in such high regard that we probably do (unfairly) expect Big Points too often. That said, I thought this was an interesting piece. hehe asking for ‘1 big point to take away from it’ just reminds me of school/college/university – i.e. bad students (don’t take it personally) just asking for some kind of easily digestible reduction while often missing the point entirely. The thing is, most worthwhile discussions are complex and layered enough that such a reduction is either meaningless or unproductive. For me this article is absolutely fantastic and raises a number of extremely interesting possibilities. 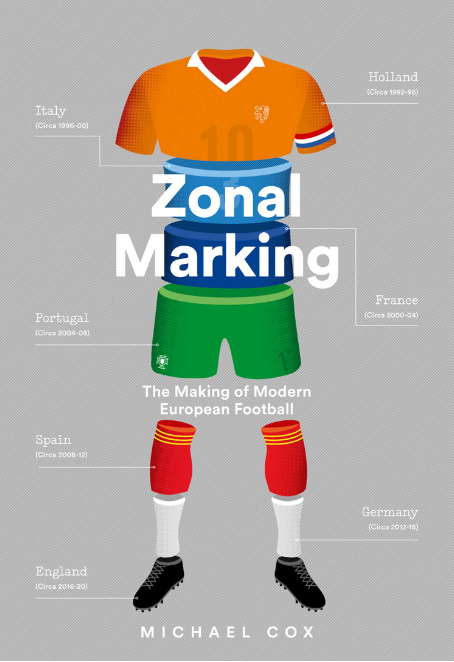 Thanks again for a very good & surprising read zm, in my opinion by far the most interesting and objective football related website out there. i may have articulated myself quite poorly which might have something to do with english not being my mother tongue. anyway, i was not looking for a big point here but i wanted to criticise that you don’t really provide any information of how it comes to these numbers. is it because of the immense numbers of passes played in la liga, is it maybe due to la liga’s risky offensive tactics in general or are there simply players with better passing skills in serie a and epl (which i doubt…). anyway, you’re one of my favorite sports writers, so my expectations may have been to high before reading it. i’m fine if you say it is just an interesting fact about rayo that you wanted to share with us. I was looking at this only today as I’m currently doing a 3 part feature reviewing the basic stats of the big 5 European leagues. 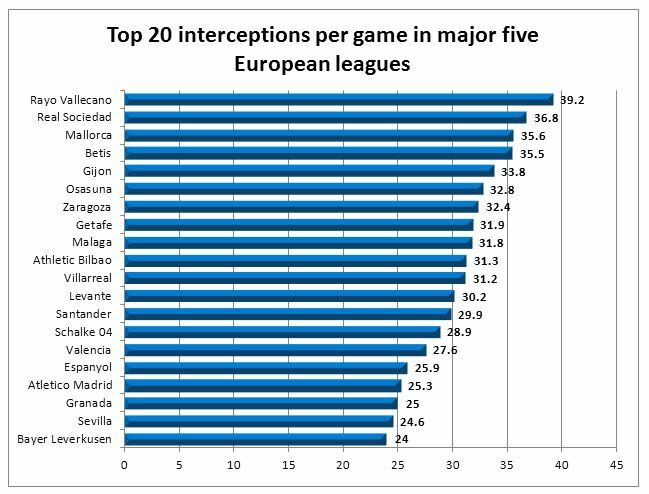 I haven’t written up the bit on interceptions yet but i was astonished to find that Spain averages 29.78 interceptions per match. 2nd in Europe is Germany with 21.52 – a big difference. England averages least interceptions with 15.46. I then looked at tackles and found that Spain still averages more tackles than any of the other four big European Leagues! Probably worth noting (after taking a cursory look at your plug) that Rayo Vallecano average the second highest number of long balls per game across Europe’s top 5 leagues (topped only by Bayern) which probably gives you good indication of their tactics. By valuable I assume you mean predictive. Where has it been demonstrated that interceptions is more predictive of wins than tackles? My intuition says you’re probably correct, after all I want interceptions to be more meaningful than tackles. I like thoughful football. But I haven’t seen statistical evidence of that. “Valuable football statistics” are in the same box as Karma and Jesus. Things that might be nice to believe in, but the existence of which have yet to be demonstrated to us common folk. ZM, I like your point about substitutions. A team is allowed three subs – supposing the manager holds one back in case he needs to change tactics or (God forbid!) cope with injury, he can use two on purely energy grounds. That would allow sufficiently skillful players to have longer careers, since they can be replaced in a match once they’re “blown”. I suppose this is why we are seeing Giggs soldiering on, and retreads like Henry and Scholes returning. Another reason, I suppose, is the long campaign against defending by hacking down attacking players. The reactionaries at the Beeb seem to be against that: or are they just pretending in order to appeal to the dimmer members of their audience? As was mentioned by others, a high number of interceptions can mean any number of things. For instance, possession statistics and number of interceptions are not necessarily related. In a frantic game where neither side has possession for much longer than a few seconds at a time, one side could still have 80% possession or both could have 50%, or whatever you like. In such a game, both teams would have high interception rates, even if a lot of the time the ball is won/lost by other means. More than the number of goals scored or who scored, these are the stats that are important – possession%, interception, passes made and attempts on goal . It makes no sense if a team has more than half the possession while the team with less possession and less attempts on goal, scores and wins. I always believe that the team that uses its opportunities effectively needs to be applauded. All the luck and other stuff are blah…blah. Interesting read…pretty unbelievable, although fair points about what counts as an interception. Interesting article, thanks ZM. According to your first table, the top 5 sides for interceptions in Europe are all currently in the bottom half of the Spanish league. Why? As Olle pointed out this could be due to the top sides not needing to intercept as often. But it could also be due to the lower-ranked sides being presented with easier opportunities to intercept. That is, if one was playing against a lower-ranked side one might think that they are pushovers and attempt more “hollywood” balls against them, many of which will obviously go wrong and be easy to intercept. So as well as percentage of attempted interceptions completed, another interesting stat (though even harder to collect) would be to weigh that by the difficulty of the interception completed. Well, considering that 18 of the 20 clubs on that list are Spanish, it’s possible that there is a systematic measurement error. Yes, La Liga is probably the most passing-intensive big league in Europe (any stats on this?) and an interception isn’t a very subjective event in a football match, but to me it seems pretty likely that statisticians in Spain are more eager to count losses of possessions as interceptions. Maybe they count cleared crosses to teammates as interceptions, or something similar. Wow, I love it, an article on one of Madrid’s other teams. Thanks for doing this. El Rayo was in second division last season, so staying at or around 13th place this year would be a success. Vallecas is a working-class neighborhood. Its residents are very proud of where they live, and El Rayo is a focal point of that pride. Taking up Xabi Alonso’s point: It isn’t just attitude toward tackling that is responsible (I almost said “to blame”) for this “press ‘n’ pass” football starting to dominate the game. Another factor is substitutions. Since a poorer team usually has to work harder to maintain parity, substitutions make it more likely they will win. Pressing has taken this to a new level. I’d like to see substitutions limited to one per game + keeper. I feel like this speaks worlds about La Liga as a whole. If you’re playing extremely high tempo, strongly pass oriented football, of course there will be more interceptions. There are more passes to intercept, after all. Does this stat really not tell us anything? Question: If pretty much all the teams with a high interception-rate (which sounds like a perfectly good quality that any team should aim for) are being found in the second halves or even at the bottom of their respective tables, doesn’t that statistic maybe tell us that intercepting is… not the best way to defend? Think about it – if an interception does go wrong, the opponent the pass was intended for can roam pretty much free. Combine that with Rayos high line and the attacker is through on goal – which would, as ZM has already pointed out, explain the high ratio of conceded goals at Rayo vs the limited number of shots. If the defender stays closer by his adversaries side though, he might not even get the ball of his feet, but still impede his actions more. He will up his chances to block his shot or get in a tackle. These numbers might be telling us: Not going for the interceptions but the direct Zweikampf (the word us Germans use for the one-on-one field player duel – i don’t know it’s equivalent in English) is actually the more effective defensive tactic. A high interception rate s o u n d s great, but the risk that comes with it seems not to be worth the gain. Hi ZM, thanks for this article, I find those details very interesting! The fact that 18 out of 20 of the most interceptful teams in Europe come from La Liga seems to be telling. If in addition, as a previous poster put here, the Spanish league also has the highest number of tacklings that seems to be odd to me. I guess what seems to be missing in your analysis, ZM, is a normalisation: since as a general trend there is more and more short passing in LaLiga, I’d normalise to the number of passes played, or better, to the number of actually interceptable passes played (by the respective opposing team). Like short (<30m distance) and flat (no hoofs) passes. If in total more passes are played, then in total more will be intercepted. Do not know though, what to make of the high number of tacklings in LaLiga (if confirmed). Tells you either something about the energy/stamina of players doing the tacklings, or about the distribution of the ball into less crowded areas (wings, goals) where there are fewer players to do any tackling. -> LaLiga: lots of short passing. Might be a silly question, but since this is an absolute, rather than relative statistic (i.e. it measures overall totals) – do we have the data for how long the ball is in play in each league? If Spain has the most interceptions AND the most tackles (as ZM points out in the discussion), could it be, at least partly, a result of the ball being in play more? 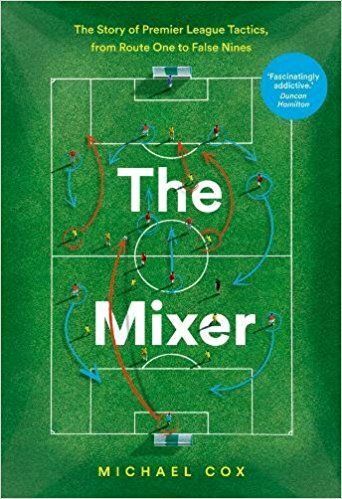 Not to say that this wouldn’t be interesting in itself – it would certainly say something about the nature of Spanish football. But since the most striking statistic here seems to be the 18/20 la liga teams on the top list, perhaps we need to explain that fact before we start asking what the correlation between interceptions and team strength (i.e. league position) is, which might actually vary between different leagues. I remember Alonso talking about his visit to Liverpool’s Academy and when he asked the midfielders what their best attribute was most of them said tackling. If you look at jay Spearing you can see this, he’s a good tackler but the amount of times I see people drift into space in behind him and receive the ball causing Skrtel to come out, I cannot even count. Anyway the man speaks like a manager I hope he goes into it! Wow! An article on Rayo Vallecano simply to tell the story of interceptions. This is why I admire you, ZM. Respect! English clubs don’t feature on this list because in English the word ‘interception’ is translated as ‘late, two-footed leg-breaking lunge tackle’. Seriously tho, great article. I loved the wee gem from Alonso. I coach a very promising side of 11 year olds and we don’t tackle that much. In fact our youngest player – a goalkeeper! – is actually our best tackler by far, in terms of being able to execute a fair and correct block tackle. The others hardly tackle – if they do I don’t really notice it much. I really thought I was remiss not teaching them to tackle, but since we’ve tried so hard to keep the ball, turns out we hardly need to tackle. And the goalkeeper beeing the best tackler, does he play in midfield? Not all 11 year olds are promising, sadly. I let the boys sort their positions out among themselves, and he prefers left back. ZM, great work as always, however i can only disagree with what “Xabi Alonso” had to say about tackling, its very important, and some players are renowned for being good tacklers, jorgenn kohler was one of the best at it, and carlos puyol does it so wonderfully that i cant remember him when he made a bad one. what is your take on that? This is a great piece and very interesting. Never understood why teams fly into tackles when they don’t need to – press the team into mistakes. You get the ball and don’t risk position or bookings. I hate doing this, but really? “Most noisest”? ^ hahahahahha. dont turn into my old english teacher. Having just looked at the whoscored.com website, the most interesting statistical analysis for me was the successful passing stats. There is a common misconception that La Liga is the possession league and the Premier League is a direct, physical, route one league. However, the successful passing stats show that the Premier League has a better passing success rate than La Liga. There are 10 teams with a passing success rate of 80% plus in the Premier League and only 5 teams in La Liga. Furthermore, Stoke who are supposedly the ultimate route one team have a better passing success rate than either Racing Santander or Osasuna. I watch games from England, Spain, Germany and Italy on a regular basis and apart from extremes such as Barcelona and Stoke, I have to say that I do not see major differences in styles between any of the leagues. This is possibly due to the globalisation of football in general in the past twenty years. The main differences come from referees rather than the players. More physical contact is allowed in England and usually, there are fewer free kicks in Premier League matches than in other leagues.